Sydney Hostel v Ammán, Jordánsko: Zarezervujte nyní! SECURITY DEPOSITE REQUIRED 25% OF THE TOTAL AMOUNT. We can host groups in different room types. 6 bedded, 5 bedded, triple, twin and single rooms. We can arrange for group transportation with certified buses for a good price. Located in a historical building, a hotel since 1963 that has been fully renovated in 2017. The Sydney Hotel is the best place for backpackers and budget travelers that are seeking a memorable and safe stay in Amman away from the noise but minutes on foot to all major touristic sites, local restaurants and shops such as the Romain Amphitheater, Citadel, local markets and restaurants and the famous Rainbow street. The hotel provides a smoke free environment, 24-hour assistance, budget tours and packages, free high speed WIFI, a spacious communal area where you can socialize and get some things done or you can chill in the cozy sunny backyard area. Most rooms have private bathrooms, LCD screen with satellite channels, minibar and self controlled A/C system... Our top rooms are the ones with balconies. The Sydney Hotel has been rated #1 on TripAdvisor for the past four years and topping the review scores on all booking sites. The hotel which is 40 minutes drive from the airport and easily accessed to public transportation. Limited free Parking spaces are found in front of the hotel but there is a huge parking adjacent to the hotel for 2 JDs per day. 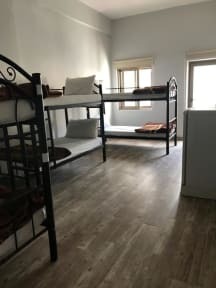 Female only dormitory with private bathroom and AC. Breakfast is not included for dormitory rate as it is optionally added and it costs extra 3 JDs. Lockers are available free of charge but you have to bring your own lock or buy one from us for 1 JD. Check out is at 12 PM, you can stay in the hotel free of charge until 3 PM then you must pay 3 JDs to use the hotel facilities until 12 AM. PLEASE NOTE that Arab Nationalities are not allowed to stay in the mixed dorms as per the local laws and regulations. If you don't hold a foreign passport do not book in the dormitory as we have other budget single rooms. There is a washing machine and dryer for 5 JDs per wash, shared fridge, microwave, kettle, toaster, and utensils for your use. As well as free drinking water. Full service cleaning on daily basis. A receptionist is always available for assistance. We can even order food for you when you are too tired to go out.